Our atmosphere protects us from x-rays and gamma-rays coming in from outer space. For this reason x-ray and gamma-ray astronomers must find a way to get their telescopes above the Earth’s atmosphere in order to make observations of objects in the Milky Way and in distant galaxies. Even though they stick high up into the atmosphere, mountain tops are still not high enough for this type of astronomy. Most x-rays and gamma-rays are stopped within the first few miles of the top of the atmosphere. One must find a way to put the telescopes very high in the atmosphere (upper 0.2%) or in space for long enough to make the desired observations. The obvious choice is to put them on a satellite, but that is very expensive, and opportunities are few and far between. In addition, one wants to use satellites for highly developed and tested instruments, and not for early testing of concepts that may not pan out. Depending on the type of detector and observation to be made, scientists have used sounding rockets and very large, helium-filled balloons to carry their new instruments above the Earth’s atmosphere. Sounding rockets do not go into orbit, but follow a parabolic arc giving a glimpse (5-10 minutes) of outer space. 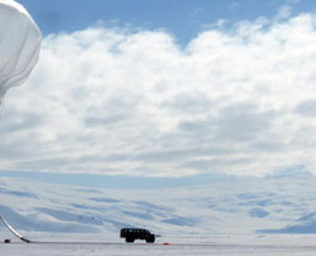 High altitude balloons do not go as high (125,000 feet), but stay up for much longer periods of time. Until the last decade, typical balloon flights lasted a day or two, with occasional transoceanic flights of up to a week. The limitations on duration were generally four-fold. First, the high altitude winds blow the balloon either East or West (depending upon time of year), and one wanted to terminate the flight before the valuable telescope and communications equipment went over the ocean where it may not be ever recovered. Second, the balloon would sink in altitude at night since the balloon would cool, and it would get too low to see any x-rays or gamma-rays. The next morning it would heat again and rise, but never achieving the same height as the day before. By clever arrangements of dropping weight (ballast) from the balloon the first night, one could come close to maintaining altitude, but the more ballast you had, the less weight was available for the telescope. Third, something could go wrong with the experimental payload, and further time at altitude would be a waste of time. Finally, the fourth reason is that the observations had been a success and the telescope had looked at all it was planned. Needless to say this is the desireable state of affairs. In the last ten to twenty years, longer duration balloon flights have been developed with better balloons and with the development of ballooning from Antarctica in the southern hemisphere summer when the sun does not set. Then the balloon does not cool and stays at the highest altitudes for up to two weeks. 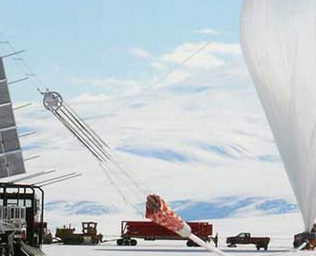 This eliminates the first two problems, since the winds blow the balloon around the Antarctic continent and it returns to the vicinity of the launch site for a straightforward recovery. At least that’s the theory, and this has been accomplished several times.